What is the Relationship Import Plugin? If you need to create many relationships between existing items in Jama, the Relationship Import Plugin can help you achieve this goal. Using a CSV file, the Relationship Import Plugin can save you time by relating many existing items in Jama at once, rather than manually relating one at a time. 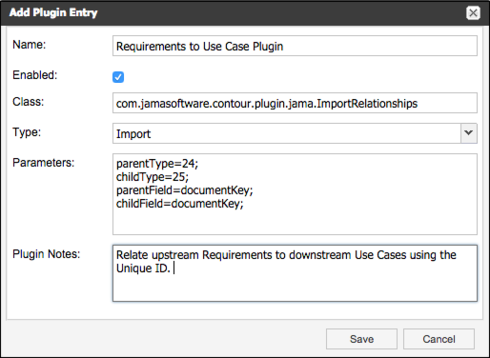 Before you can use the Plugin, it will need to be configured by an administrator in your Jama instance. To do this, navigate to Admin > Plugins. Select Add Entry. Name: The name of the plugin that will display to you and your users. Enabled: Having this checked will make this plugin available to your users. 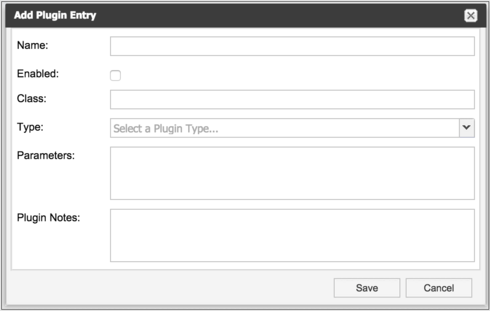 Type: For the Relationship Import Plugin, you will choose Import. You will need to define what Item Type the Parent and Child items are (shown below as parentType or childType), as well as what Field you are using within those item types (shown as parentField or childField). Please note that parameters are case sensitive. Be sure you are capitalizing (or not capitalizing) the correct words. A semicolon is required at the end of each parameter. The "X" you see in the parameter will be the API ID of the Item Type you wish to use. You can find the API ID under Admin > Item Types. The next parameters to create are determining which field of the parent and child item you wish you use. You can see which fields are available to use under Admin > Item Types > [Highlight the item type you want to use in the parameter] > Config. Remember that parameters are case sensitive, and a semicolon is needed at the end of each parameter. 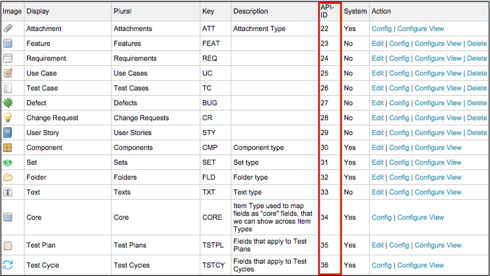 Plugin Notes: A short description of the plugin that is not required for configuration. Your parameters can be written in any order. As long as they are case sensitive with the correct Type and Field and have a semicolon at the end, your plugin will be able to relate the items successfully. Once everything looks correct, save your plugin. 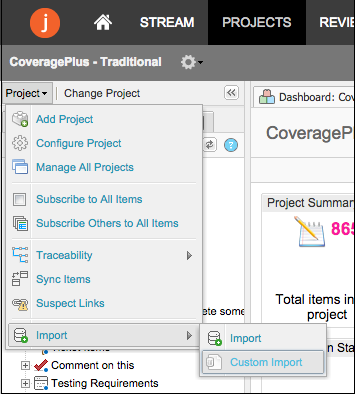 In Jama, select Project > Import > Custom Import. 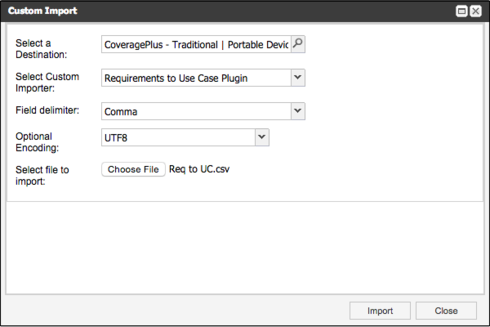 Attach your CSV file and select Import. You will see a notification at the top your screen after the import is complete that says, "Success: X items imported." How many relationships can I import at once? It is recommended to import relationships in batches up to 250 items to prevent performance degradation. Do I need to install anything on my Jama Instance? No, the plugin is automatically installed by default. Does it support one to many relationships as well as many to many relationships? Yes, you will need to use the Cross-Project class when setting up the plugin. I'm receiving the message: "Success: X items imported," however no relationships were created. Why could this be happening? Double-check that you are importing a CSV file, and not an XLS file. Give Jama time to process the relationships. If you are importing more than a hundred relationships, this will not be instantaneous. Check that your parameters are written correctly, and are referencing the right API ID or Field. You can see that the parameter is using ID, which is a Label instead of a Field (the parameter should be parentField=documentKey;). The logs will tell you which items were skipped in the plugin, and why (these have been bolded). If you are still unable to successfully import relationships, please submit a ticket with Support and attach screenshots of your plugin settings, Item Types, and the CSV file.